I am a demonstrator. I’ve been to demonstrations in Hebron (where I almost took a tear-gas grenade to the head), Nabi Saleh, Bil’in, etc. Tonight was the first time I felt truly afraid at a demonstration. 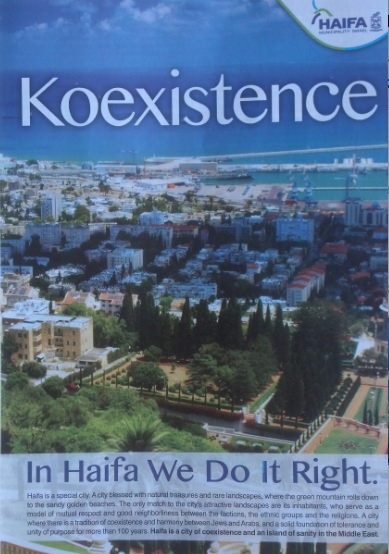 And it was in Haifa. 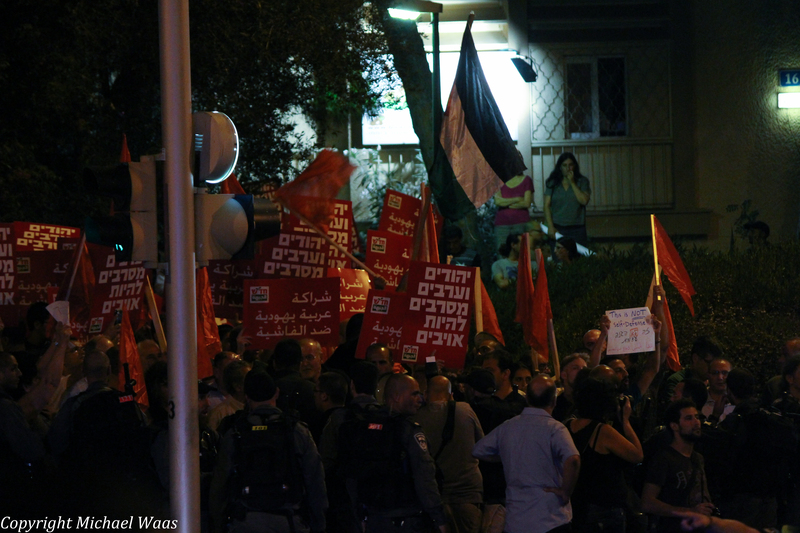 Last night, people broadly aligned with the Hadash political party organized a demonstration in Haifa, titled ‘Stop the killing of children and civilians. Progress towards a just peace.’ As a supporter of Civil Rights and as an opponent of pointless violence I went out into the streets of my own neighborhood in Haifa today to ask that the soldiers (some of whom are my close friends) be brought home immediately. On the way to the demonstration I had a plastic chair thrown at my head. I shrugged it off—surely once I got to the demonstration spot the police would protect me. 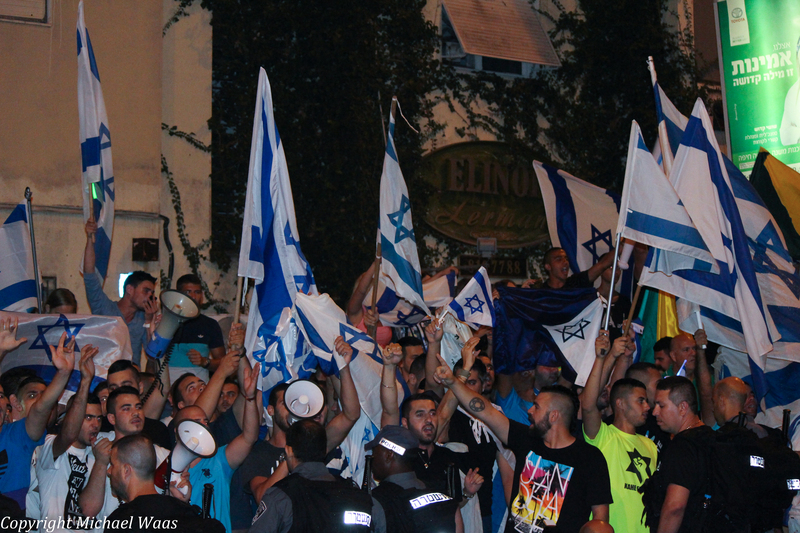 When I got to the place that the demonstration was called for, I saw hundreds of people waving giant Israeli flags and chanting, in the usual happy tunes, lyrics about Mohammed being a son of a whore from Gaza who works in construction, as well as wishing Arabs a speedy exit from this temporal realm. I crossed the street to the other side, where I spoke to a cop in plainclothes. “Where are the people who are against violence?” I asked. “There,” he replied, pointing at the crowd. “I’m alright with that,” he replied. Eventually, I found a few people and we crawled over walls and through bushes, and eventually made it back to my apartment. We could hear a helicopter circling overhead (why? To better document the police’s ineffectiveness?) and roving gangs chanting in the street, attacking one of the buses that brought left-wing demonstrators from outside Haifa. I later learned that the police used a water cannon and police horses on some of the right-wingers who were preventing people from leaving, but to no avail. There were just too many of them. The police ended up commandeering a public bus to take 80 activists to the Hof HaCarmel parking lot near the beach, where they transferred to a bus organized by the activists. Right-wingers were waiting for them at the beach and threw stones at that bus as well, breaking two windows. It was reported that eight left-wingers were arrested; all were released unconditionally at 4:30 am. About a dozen were wounded either from projectiles or beating; a broken nose and a broken shoulder were among the most serious injuries. It is still unclear how many right-wingers were arrested. 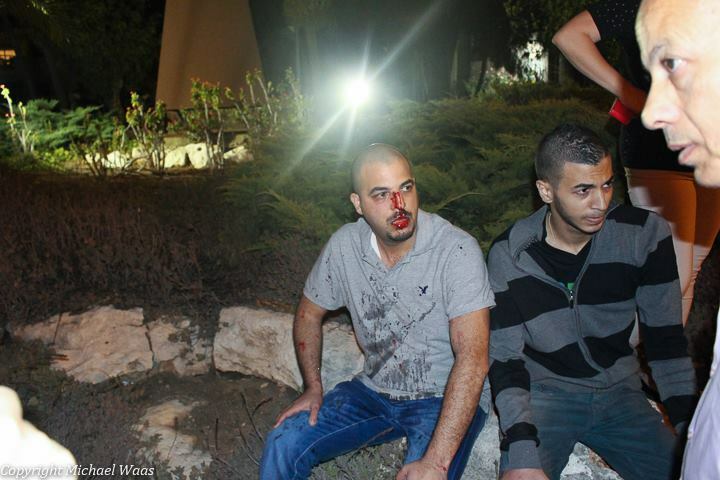 Last night, the police did very little last night to protect the anti-violence demonstrators, many of whom were Palestinian. Last night, it felt for a moment that there was nowhere to hide from the fascist mobs, as, ultimately, there is nowhere to hide from the Occupation. You’re a stupid idiot. I feel sad for you! Am Yosrael Chai sucker! !